Browned butter. Scallops. White wine. Tomatoes. Basil. Pasta. YUM! And sweet corn, parmesan and burrata too (if you’re into that, which I totally am). 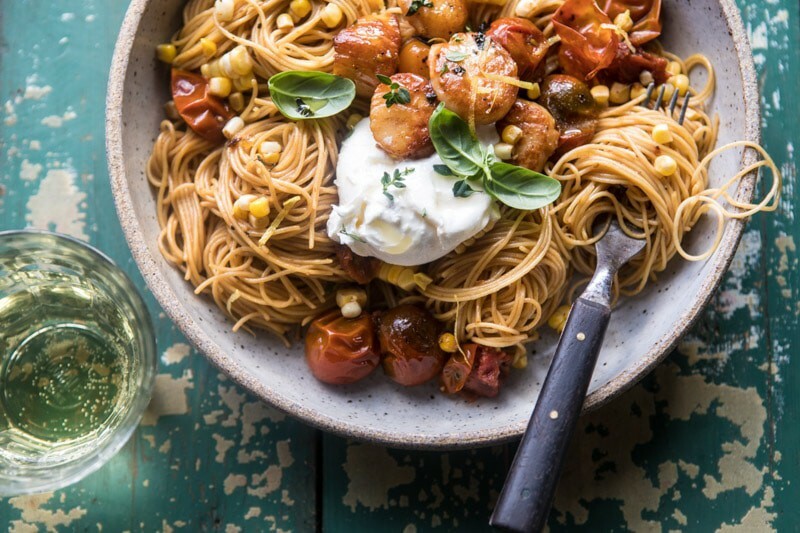 I mean, can you say summer pasta perfection or what?? It probably comes as no surprise that I am loving the change of seasons over here, because with the change comes new recipe ideas and fun produce. That said, there’s really nothing crazy different about this pasta. 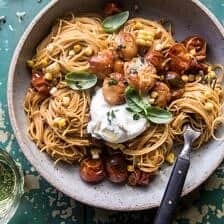 I mean, you can make tomato basil pasta just about anytime of the year, but I always find it best this time of year, when the gardens are bursting with fresh basil and the tomatoes are just beginning to turn ripe enough to eat. If you guys follow along on Instagram Stories than you know I am up to my ears in fresh basil. Like literally up to my ears. I think I have twelve basil plants sitting on my windowsill and I could not be happier about it. Basil is by far one of my very favorite herbs, probably my favorite, but I hate to choose solid favorites when it come to food. I made this pasta last week as a quick dinner, and again if you follow on Insta, than you already know all about this recipe. I did a quick story on the cooking process and I think, to date, it’s one of my most popular stories I’ve posted. So many of you requested the recipe, so here it is! I was kind of testing the waters for a new recipe I had in mind for the blog, but this version ended up being so good that I stuck with it. 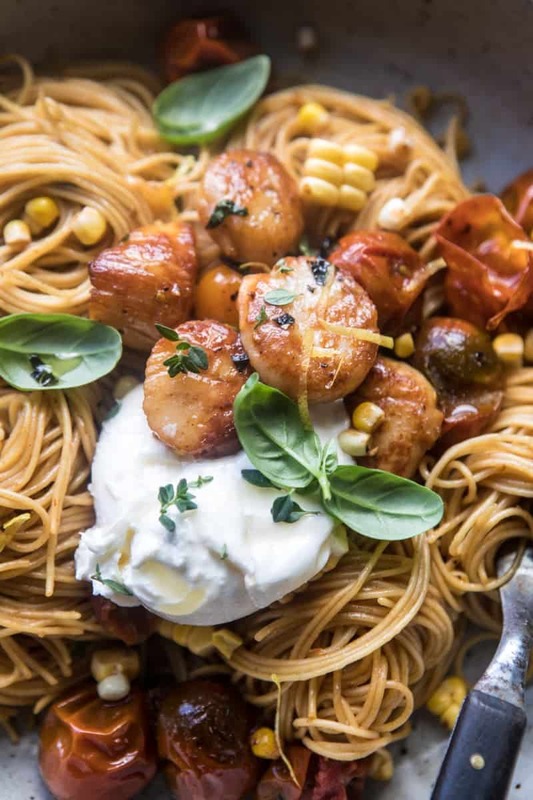 I mean, how could anything with browned butter, scallops, and pasta not be delicious? Also, I LOVE when these last-minute dinners turn out to be blog worthy. I don’t know why, but it seems I do my best recipe developing in a hurry, with ingredients I have on hand at that given time. For some reason, these are always my favorite recipes (hello to this chicken)…this pasta included! OOKOK, so jumping right into the details of this recipe. 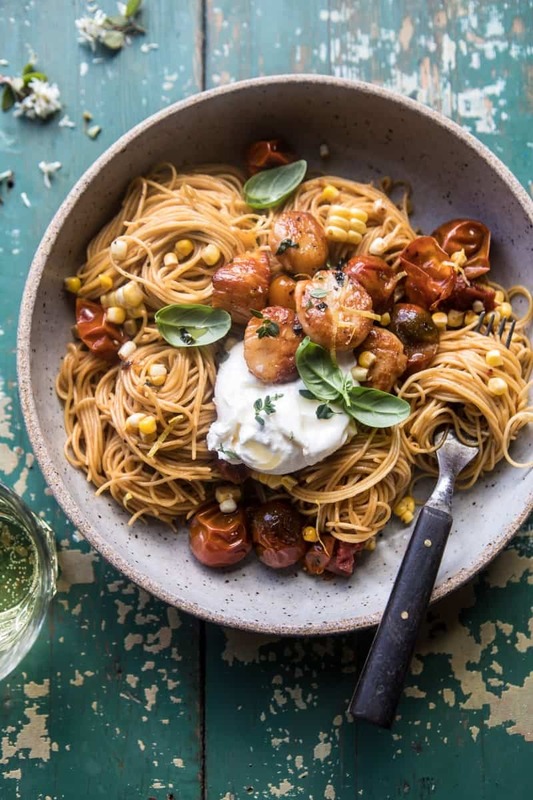 I used angel hair pasta because it’s what I had in my pantry. Ahh, wait I have almost every kind of pasta in my pantry, but truth is, I love angel hair the most. My mom ingrained this into me from a very young age, and I think it will always be my favorite. 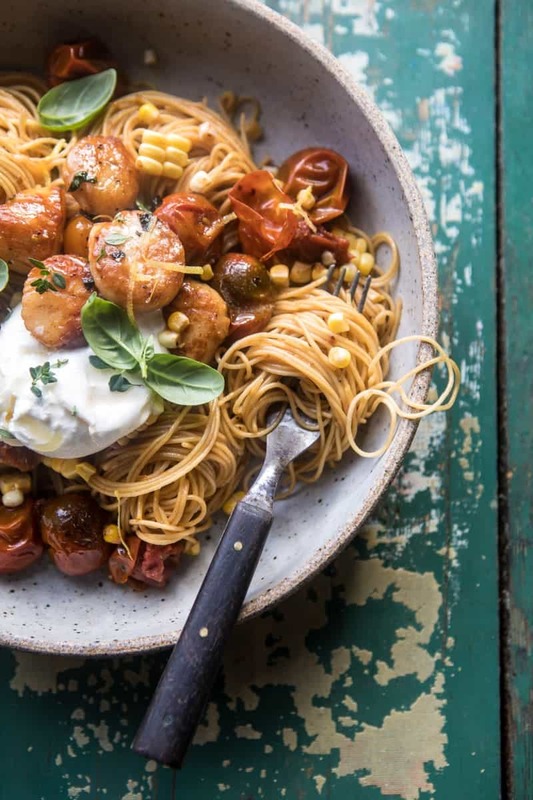 You can of course use any long cut pasta you love, but angel hair is my go-to. 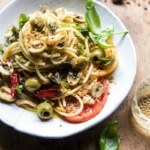 Like a lot of my summer recipes, this pasta is simple. You start out by cooking the scallops, then add some garlic, herbs and butter. Let that butter get a little brown and toasty, and then add a splash of wine. Yes, wine on a Wednesday, and it’s the best thing ever. Obviously. Now add some pasta, toss everything together with some parmesan, lemon zest, and fresh basil, and you are DONE. 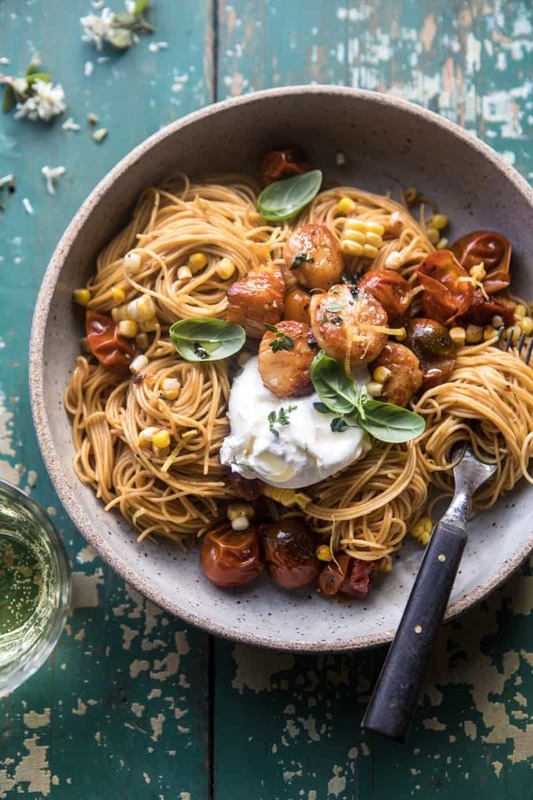 Pour yourself a glass of wine, fix up a big plate of seafood pasta, and relax out on the patio or deck with the perfect summer night dinner. Also, that is a ball of burrata cheese on top. It’s totally optional, but seeing as I’ve been adding burrata to pretty much all of my recipes these days, it was a must for me. My new motto…everything is better with burrata…and basil. 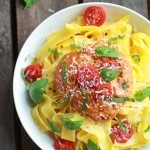 Browned Butter Scallop and Burst Tomato Basil Pasta from Half Baked Harvest on Vimeo. 2. Meanwhile, heat a large skillet over medium heat. Season the scallops with salt and pepper. 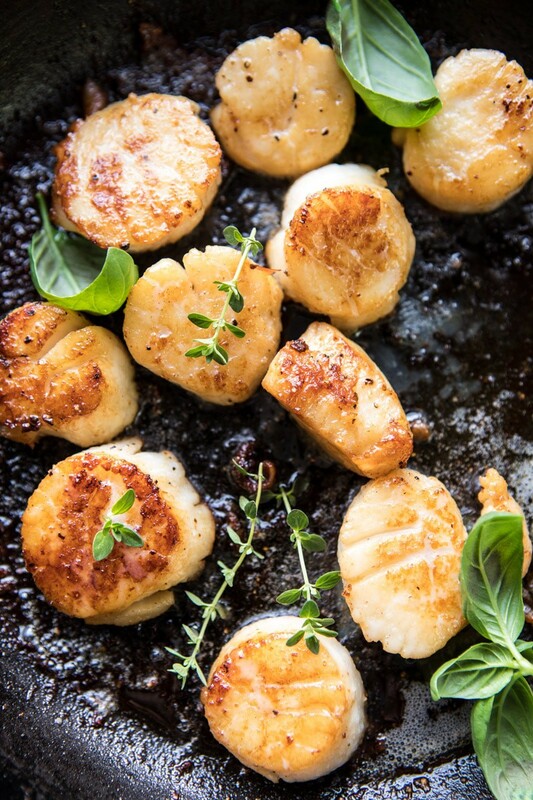 Add 2 tablespoons olive oil to the skillet and when the oil shimmers, add the scallops and sear on both sides until browned, about 2-3 minutes. 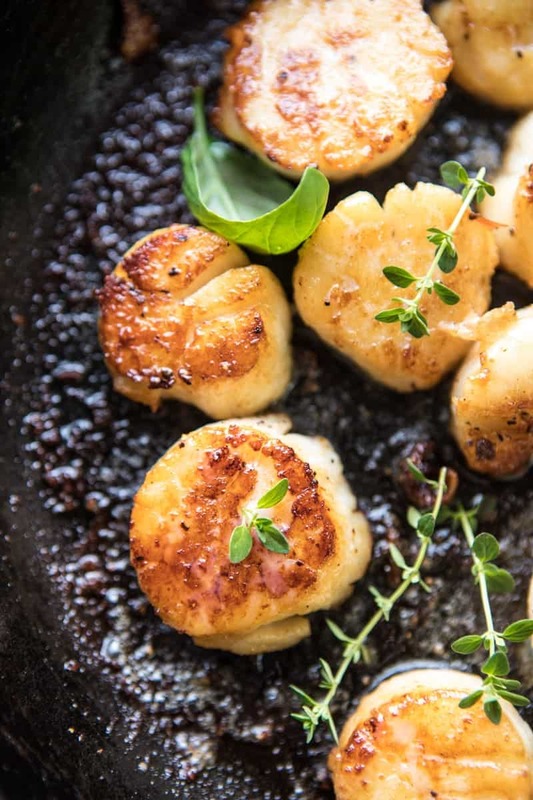 Remove the scallops from the skillet to a plate. 3. To the same skillet, add the remaining 2 tablespoons olive oil, the garlic, thyme, and crushed red pepper flakes. Cook until fragrant, about 3-4 minutes. Add the butter and cook until just browned, another 2-3 minutes. Slowly pour in the wine. Add the tomatoes and corn and cook over medium heat until the tomatoes burst, about 5 minutes. 4. Add the scallops, pasta, parmesan, and basil to the skillet and toss to combine. If needed, thin the sauce with a little of the pasta cooking water. Remove the pasta from the heat and divide between plates. Top with torn burrata, lemon zest, and fresh basil. EAT. 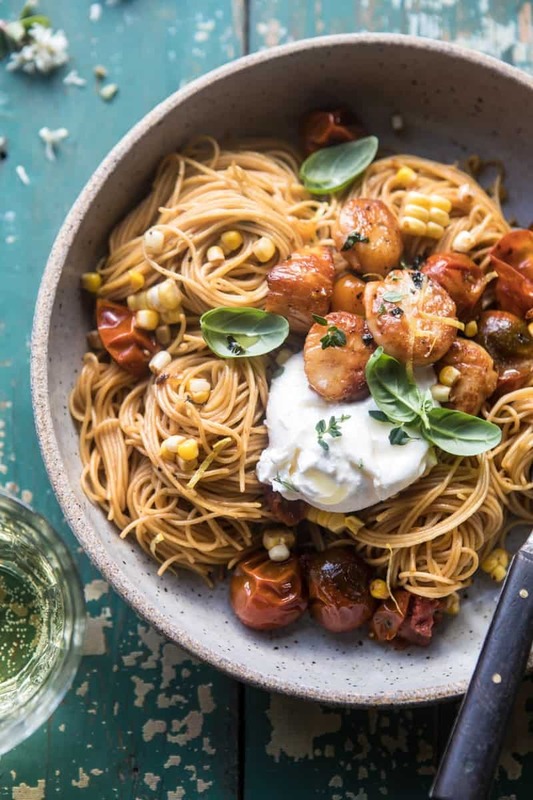 Nothing better than carbs, butter, cheese, and wine…all together in one dish…Happy Wednesday! Yes, I’ll have one of these, please!!! 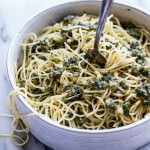 Angel hair pasta is my moms absolute favourite, so will have to make her this next time she’s visiting!! Yes!! Its the best, hope you guys love it! ALWAYS needs burrata!! Yes! Loving all the basil. 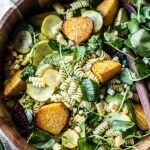 Wow this pasta looks divine! So summery! Saw burst tomatoes and was instantly hooked. Looks marvelous! Thanks for the inspiration! Ah in love with burst tomatoes! Too good, thanks Margaret Ann! This is seriously BURSTING with summer flavors! Your tomatoes always look so magical. What do they put in that CO soil?! Ha! Great Pasta! Ah thank you so much Elizabeth! I wish I knew but I do love them! Love the acidity of tomatoes with the richness of browned butter and scallops!!! Such a great idea! I love scallops but often find them way too rich! Thanks so much! They can be quite rich sometimes!! Carbs, butter, cheese, and wine? Yes, please! 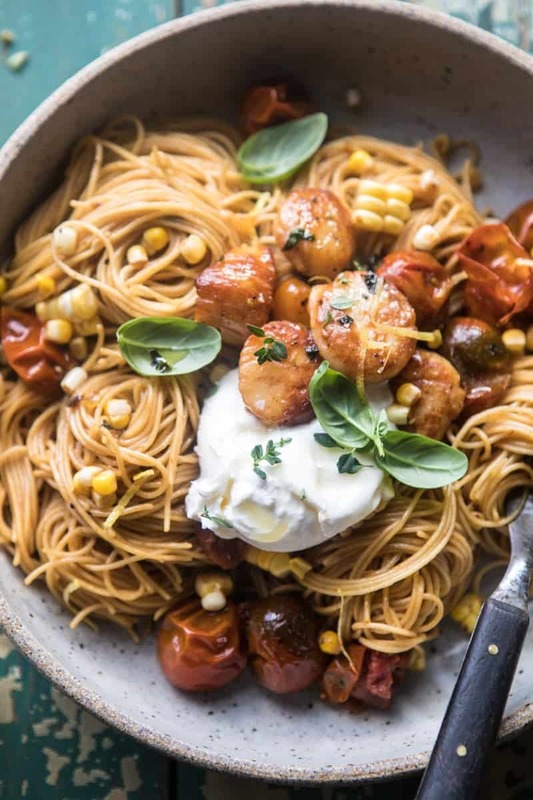 Those scallops are perfection, love this summery pasta! They were too fun!! Thanks Laura! It was 8 degrees here the other day and I thought, I miss summer. So I made this recipe. I did sub canned Del Monte gold and white corn for the fresh. Also, I didn’t have burrata but I used small balls of fresh mozzarella. (I know it doesn’t hold a candle to the burrata but I just had a baby and the grocery delivery service doesn’t offer it! Haha) Anyway I have always been intimidated to make scallops but they came out great and were definitely the star of the dish. Cast iron was key as per usual. Hubby filled up on them and neglected the pasta; my 2 y/o filled up on the pasta; and I ate everything all together. Delicious!!! Definitely will make again for company sometime. Thank you! Yes, totally have those days too! I am really glad you liked this recipe, Kristen! Thank you! !